paths of light changing the darkness of the six destinies into brightness. individually is able to emit brilliant light. 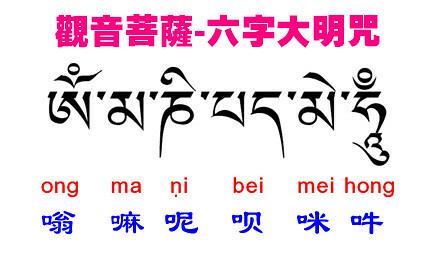 exclusive mindfulness and recitation of "Na Mo A Mi T'o Fo", the "Vast Six Character Name". below. 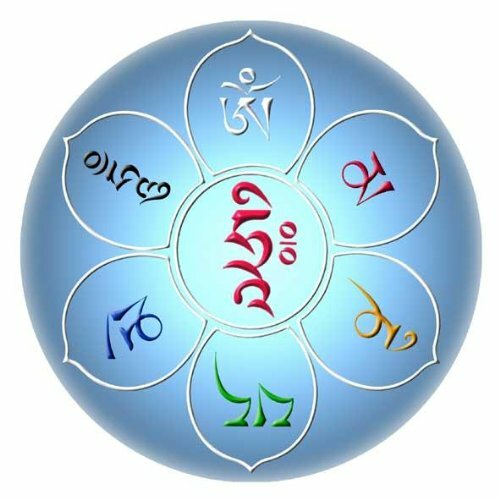 This is the first sound in the mantra. also fulfill your wishes in accord with your thoughts. Every vow you make will be fulfilled. wonderful mind of Avalokitesvara Bodhisattva. This is "pa mi". also means "success"; whatever you cultivate can be accomplished. meanings would be immeasurable and unlimited; they cannot be completely spoken. time from his or her activities to recite the Six-Character Great Bright Mantra. suffering out of each of the six realms of suffering filled existence. samsaric realm of the Gods. entertainment in the samsaric realm of Demi-Gods. in the samsaric realm of animals. in the samsaric realm of hungry ghosts. the samsaric realm of hell. and in this way liberates us from all our negative karmas. Chanting by FGS monks in Taiwan. Note: I lowered the original playing speed to 94% (lower pitch/tone) and did some editing.